Meet the amazing ice-skating DOG: an adorable Labrador who spends his days in the rink after being rescued from euthanasia. Benny, a five-year-old Labrador, has been learning to skate for a year after Cheryl Del Sangro, 56, its owner took him along to train on a whim. 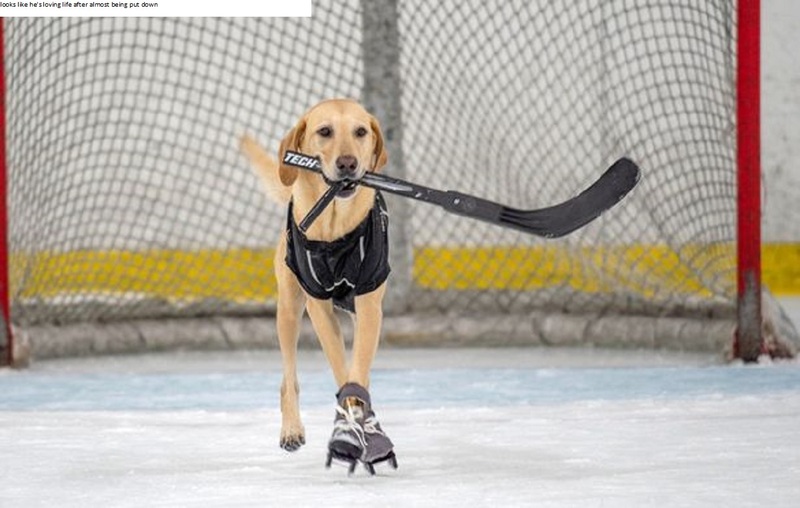 During that first foray on the ice last winter, lovable Benny scooted around on the ice after his owner, skillfully and v and - picking up pucks. It inspired Cheryl, who saved the puppy from death row in a shelter when he was only a few months old - to take him under her wing as her newest student. Since then, Cheryl has taken Benny once every two weeks at the Las Vegas Ice Center, where she teaches him a series of tricks including turns, bunny hops, and crossovers. She even made the dog a special pair of ice boots by attaching blades to the doggy shoes, which he used on his front paws while using his hind legs for grip. The amazing videos show the talented puppy whizzing masterfully around the ice, and one clip has even racked up 30,000 views on Facebook. According to Cheryl: “From the first day, I couldn't believe how anyone could not want this dog. “He was absolutely perfect. We had this bond from the first day, he is the happiest dog and he likes to learn new tricks". “Now, you can’t stop him off the ice, it keeps getting better and better.